Along with technologies like G-Sync and ShadowPlay, Nvidia also announced this week that they’re expanding on their streaming technology. Gamestream is a new bit of tech that will allow you to stream games from your PC to your massive living room TV through the power of Wi-Fi. There is one little hitch though: you’ll require an Nvidia Shield to do it. 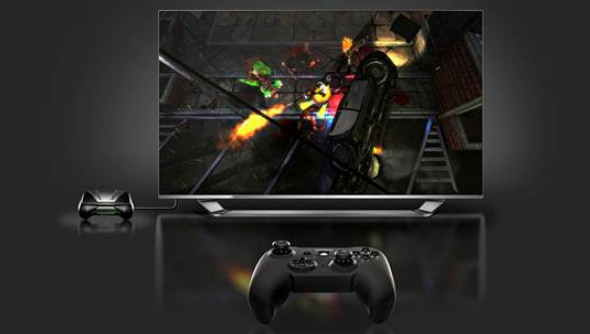 Gamestream basically streams your game to the Nvidia Shield – exactly as the Shield functions already – but then allows that streaming data to be pumped down a HDMI cable into your TV. You can leave the Shield by the TV and then pair a bluetooth controller with it for maximum versatility, essentially making the Shield like some kind of Roku box console. At Nvidia’s reveal of Gamestream, the technology was shown being used on an LG 4K television with a demo of Batman Arkham Origins. Gamestream, along with the software updates to GeForce Experience and the Shield, will be made available sometime in the next few months.